Have you heard about the DropBox Space Race? No, it isn't the moon related thingy. Rather, it's perhaps more exciting to those of us who're more into the web and 'the cloud' and stuff. 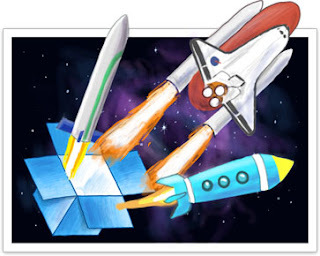 The Space Race is a new initiative by DropBox, encouraging students to use their school/college email addresses, and get more space out of their DropBox accounts! You can sign up, or connect your college email address with your current account, and instantly get 3 GB of space! So if you have an email address that ends in .edu (eg, yourname@domain.edu), then you might as well use it to earn more space! DropBox has its origins in college, which is why it is always so supportive of students. This is in fact a move to get students to collaborate more on DropBox. And of course, the concept of referrals is stronger than ever. Here's how it works. When you connect your college email, you get an instant 3 GB space for 2 years. And if you register for the Space Race and then go through the Get Started guide (if you already don't use DropBox), then your college will get three points. Refer more people, and get the standard 500 MB per referral. In addition, the more classmates you rally, the more points your college will get, and the more storage you will get up-to 25 GB! To start off, visit the DropBox Space Race, and enter your college email address. Click on Send Notification Email. You will be sent an email on your college email account, and when you confirm the link within, you will get 3 GB free storage instantly! And if more of your classmates join, your college will make the next levels, and you all will get free extra storage up to 25 GB. Cool, huh? With DropBox, you can do all sorts of stuff. You can share folders and work collaboratively, teachers can assign homework and students can submit it, you can use it to share files on Facebook, you can use DropBox to host a simple website, and what not. DropBox and its apps are the tools, and the sky's the limit. So become a Space Racer now, and earn free space! If you still have a confusion, feel free to ask. For more information, check out DropBox TOS. That's really good one...i enjoy reading it..
can u tell me where can i get .edu Email for Free.. as i dnt have it..
Great post bro. Thank for the info. Just invited my friends and got 3GB of space, for free. Awesome! it was good but just think about it.. was it a "My Blogger Tricks" Topic???? You all are changing your stream guys.. I use to think how to use that feature but i think i can't because i don't have any connections with .edu mails, even my college domain is .com., huh my bad luck gotta move to sky drive. Nice explanation. I also use drop box in my wordpress :-) . Thanks for sharing this info.